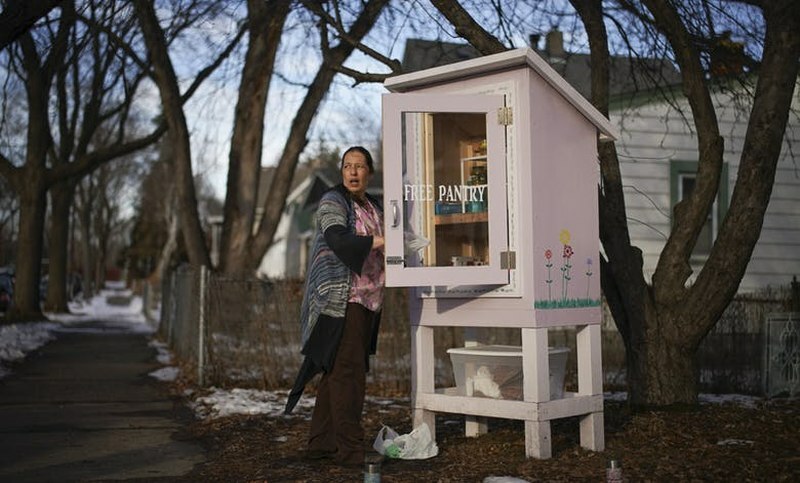 After she got home from work, Jamie Hendricks restocked the shelves of the Little Free Pantry she maintains in front of her home in St. Paul’s North End. And, just like that, the North End Free Pantry was born. However, soon after she started cramming free food and necessities like toothpaste and laundry soap into a bathroom medicine chest, one thing became abundantly clear. She needed a bigger cabinet. She doesn’t claim a patent on the idea; a Google search soon after she got the idea uncovered similar free food pantries popping up across the country. Still, her efforts may be inspiring others locally to clone the idea. St. Paul Public Works has erected a Community Cupboard filled with free food and household items in front of its Dale Street maintenance facility about a mile away and coordinates supplies with Hendricks. And there’s talk of the neighborhood’s community council putting up a free pantry of its own. Some of the goods in the Little Free Pantry Jamie Hendricks has been stocking in her front yard. The Little Falls, Minn., native has lived in this historically blue collar neighborhood of St. Paul for more than 20 years, watching hard times affect her family and others. Homelessness, poverty and unemployment sap area families of their ability to obtain the basics, she said. When she worked at an area elementary school, she said she knew parents who struggled to put food on their tables and children for whom school breakfasts and lunches were the only meals of the day. Taking note of the now-ubiquitous Little Free Libraries, she got the idea to fill one with food instead of books. So she called St. Paul City Council President Amy Brendmoen’s office to see if she needed a permit. Hendricks said she was told that as long as she wasn’t charging for the food and the pantry was in her front yard and not on the boulevard, she was good to go. During a Friday night neighborhood social last May, she told her neighbors about the project. A Facebook page was started. Donations were solicited. A couple of months later, she realized her cabinet was too small. That’s when Deborah and David Hemingway stepped up. Recent transplants to the neighborhood from rural Wisconsin, the Hemingways had been looking for their own way to get to know their neighbors and help their new community. So they built the new pantry, free of charge. It seems to have done just that. A cadre of about 30 area volunteers regularly answers Hendricks’ social media calls to replenish supplies. The things that are needed immediately go into the pantry. The rest goes into a freezer or a closet in Hendricks’ home to stock the pantry later. Someone buys a bunch of boxes of macaroni and cheese? Great, they go into the pantry. A store has a sale on canned vegetables? Into the pantry (in warmer weather). Hendricks will buy things like laundry soap in bulk, then she and her two daughters will divvy it up into jars that people donate before putting it into the pantry. Fruit roll-ups, tampons, mouthwash, soap — it is all welcome. She even assembles birthday party kits — cake mix, frosting, candles, balloons, eggs and oil and a little gift — to give to those who request it. “We just say contact us a week before so we have enough time to pick up some stuff,” she said. About the only things Hendricks won’t take are razors, medication or perishable foods. And, yes, she complies with expiration dates. Angelique Rush has used the free pantry several times. She is married with four children aged 4 to 17. While her husband works full-time, she works part-time after a previous full-time job didn’t work out. Her family, which does not qualify for federal food benefits, sometimes uses an area food shelf. And, sometimes, when food shelf hours don’t jibe with works schedules, the North End Free Pantry becomes a stopgap for a family with six mouths to feed, Rush said. One thing Rush said she really appreciates about the pantry is the anonymity of it. She can go whenever she needs some sugar or a loaf of bread, take out a few items and go home. Over the holidays since Thanksgiving, she said she’s used it at least once a week. Rush, who lives about a mile away from Hendricks’ home, said she’s heard the talk about putting free pantries in other neighborhoods around town. She hopes it happens.